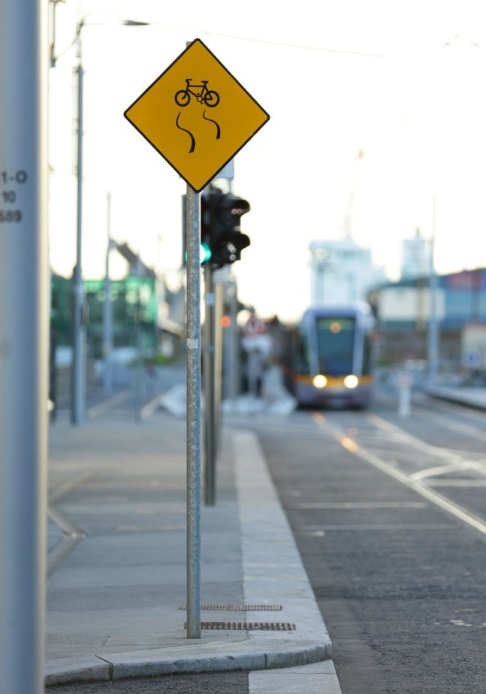 Luas shares space with cyclists, pedestrians and motorists throughout the Luas network. There are many safety measures in place to protect cyclists, pedestrians and motorists as well as Luas trams, drivers and passengers. Also Luas drivers are well trained to ensure the safety of cyclists, pedestrians and motorists as much as possible. Read on below for key information on how cyclists can stay safe when sharing space with Luas trams. Cycling is not allowed in Tram Lanes; Tram Lanes are dedicated areas for trams only. 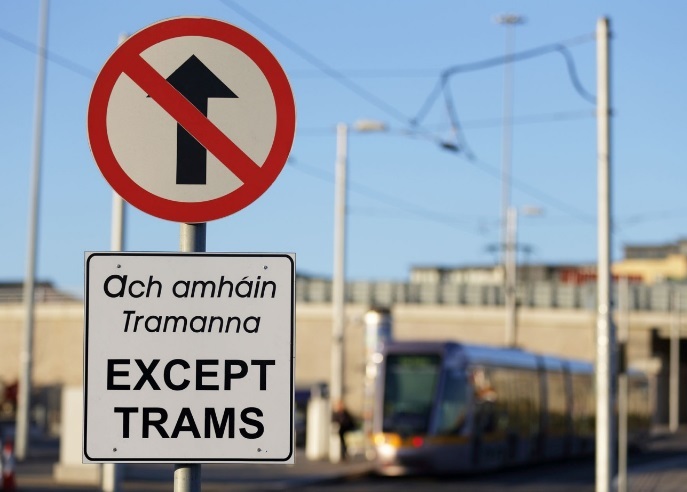 Tram Lanes make up 91% of the Luas tracks and are designed for trams and not for cyclists. Tram Lane surfaces, track grooves, tram junction signalling and tram traffic pose a risk to cyclist's safety. All Tram Lanes are clearly identified by warning signs, shown above, which are located at the start of the segregated sections. A warning sign, shown above, located at the start of the segregated sections. The Tram Lane being raised above the level of the adjacent road way. A cobble set surface along the Tram Lane. The Tram Lanes being delineated by a continuous, do not cross, white line. It is a contravention of the Irish road traffic legislation to cycle in Tram Lanes. Irish road traffic legislation can be accessed at the website of the Office of the Attorney General of Ireland which contains a searchable database. Irish road traffic legislation is also summarised on the Department of Transport, Tourism & Sport's website. The Luas tracks and trams cross many road junctions used by cyclists and drivers, especially in the city centre. Cyclists may cross the tracks at junctions with other road traffic but cyclists must not cycle along the track through junctions in Tram Lanes. For cycling along the tracks in Shared Tramways including Junctions see Shared Tramways information and safety advice below. 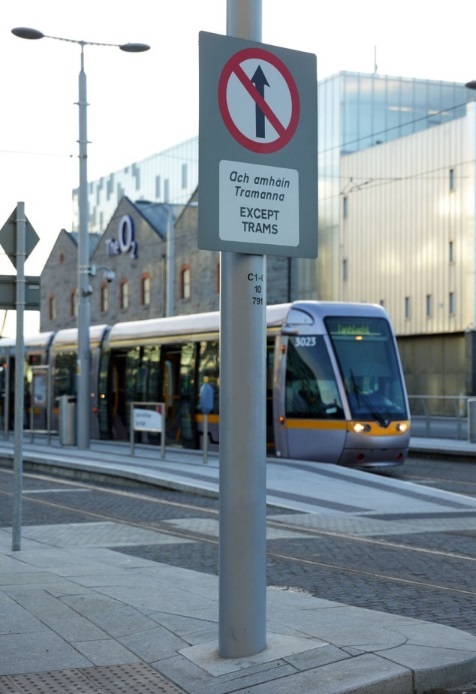 In a limited number of locations Luas tracks are located in Shared Tramways which are used by trams, vehicles and cyclists. The easiest way to identify Shared Tramways is watching vehicles; as a rule of thumb if cars and buses are allowed to drive on the tracks, cyclists are allowed too. 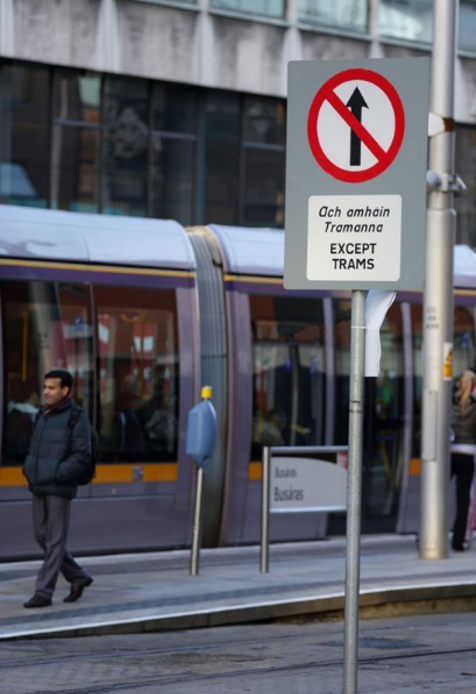 Do you sometimes drive or walk around Luas too? If you do please check out information about Driving Safety Around Luas here and Walking Safety Around Luas here. For other information about Cycling & Luas see our Cycle & Ride page here.